Clarify 2 ManualClarify Desktop Working with TextCan I change the text size of words in the article description or step instructions? Clarify does not provide a way to independently change the size of words within the article description or step instructions. The size of the text as a whole is determined by the format you are exporting to. For example, the PDF template determines the size of the text when exporting to PDF. The CSS on a WordPress site determines the size of text when you export to WordPress and so on. 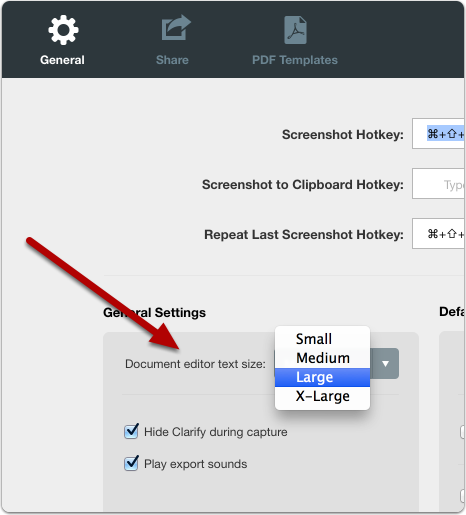 You can, however, change the overall size of the text in the Clarify document editor. From the General preferences pane you can choose the relative size of text in the document editor. Note that this will not change the size of text when you export, just while editing. Next: How do I share Clarify documents? Any chance we will be able to adjust the font size in PDF's in the future? The text is so huge when I make them, and I would love the option to make the text smaller so I can fit more text on a page. Thanks! This worked great, and I made a new template that fixed the problem I was having.